THE fight to bring high-speed internet access to Villefranche du Périgord is gathering pace. Led by Frenchman Georges Bolbach the plan is to petition French Telecom with the names of people who want an ADSL service in the area. The service will only be rolled out if there is enough interest from people and business owners, so Georges is working hard to gather contact details. Georges explained the benefits of the ADSL service, he said: “It is much faster than regular internet access and allows you to have the internet on at all times. For people with gites in the area it would allow them to upload short films of their properties quickly and simply. People could also have a short audio clip welcoming visitors to the website, describing themselves and the business. And because it is always on and charged at a flat fee, guests who just can’t pull themselves away from the office could still access files whilst on holiday for example. “All I need from people is contact details to add to the list I’m already building,” said Georges. “No one is committing themselves to anything, all you are saying is that you would like to see an ADSL service made available for the area. Well, I've been passing through East Africa for the past 30 months - mostly Kenya. 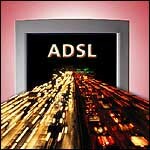 Although DSL service exists in Nairobi, the problem is that people (perhaps Telkom Kenya technicians, etc?!??!) are stealing the telephone cable for the copper wire so wireless is the better alternative for the moment. However, 3 separate undersea fibre optic cables are being laid around the Indian Ocean coast, so I expect things to get better in a year or so. But I really don't know how this is all going to pan out once said cables go live. Some infrastructure work is still needed to maximize the use of this broadband. For now, I'm sticking with EDGE/HSDPA/3G mobile Internet service from Safaricom and Celtel. It's not too bad for 10 to 12 Kenya Shillings per MEGABYTE.